Before beginning this program, please make sure you have some weight lifting experience. If you do not, learn the basic lifts and perform them for 4 weeks at light and moderate weight. follow the tempos provided and keep your body strong and tight. Warm-up – 5 minutes on treadmill, elliptical, or rowing machine (moderate intensity). This is a continuation of your warm-up. Go slow and work on form. Jump as high as you can using only your calf muscles. As soon as you touch the ground, immediately explode back up into the air. Use a regular flat bar for double arm curls. Use moderate weight (75%). help with recovery as well as strength gains. and x means you explode and move the weight as fast as you can while maintaining good form. 1RM stands for your 1 rep maximum. This is the weight you can do for 1 rep and 1 rep only. Rest 2 minutes in between sets. The tempo on bench should be 3-0-2. Rest 2 minutes in between sets. The tempo on dumbbell bench should be 3-1-2 . Rest 1-2 minutes in between sets. 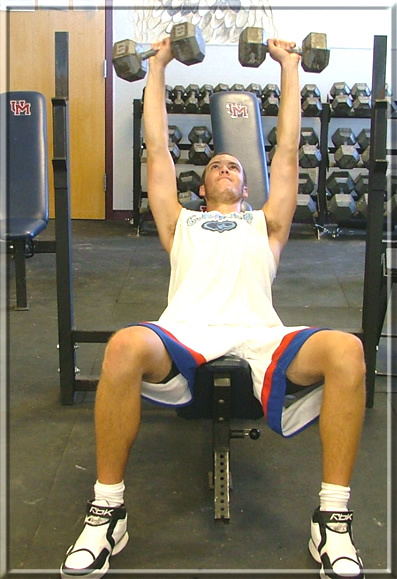 The tempo on shoulder press should be 2-1-1 . Use moderate weight (75%). Lateral Raises – 2 sets x 8 reps.
Go slow and keep your body steady. Do not swing or jerk the weight up. It is hard on your shoulders and not as effective. Cooldown : 3 minutes jogging followed by stretching or 5 minutes working on post moves. Notes: Follow the same post-workout routine as Monday. trying to knee yourself in the chest. This exercise is best described as exaggerated running. Try to make each stride as long as possible. Try to jump as far as you can and stick the landing. Long jump diagonally at a 45 degree angle. Immediately upon impact, jump back straight. one out slowly until it is parallel to the ground. This will throw your center of gravity off, forcing your abs to stabilize. Keep your abs tight; they will be contracting isometrically except for their stabilizing action. Ifthis is easy for you, grab some light dumbbells (5-10lbs) and the difficulty will become evident. 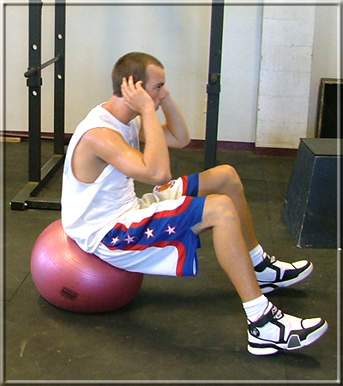 Crunches on a swiss ball will force you to stabilize. Stretch over the back of the ball (elongating your abs) and contract them to pull yourself up. Squeeze at the top of each rep.
Notes: Implement the core workout into other workouts. Do not just do it on Wednesday. Adding one or more of the exercises into each workout will build valuable core strength for controlling the paint. Follow the same post-workout routine as Monday. Rest 2 minutes in between supersets. The tempo on dumbbell bench should be 3-1-2 . Rest 1-2 minutes in between sets. 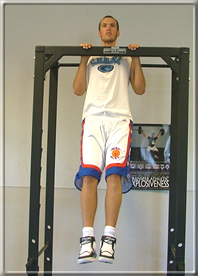 The tempo on shoulder press should be 2-1-1 . Use moderate weight (75%).Lateral Raises – 2 x 8 reps.
shoulders and not as effective. immediately explode back up into the air.